Breathing is a measure of your well-being. It’s an indication of how you feel and is intrinsically connected to all of your actions, thoughts and feelings. Breathing is the single thing you have repeated more than anything else in your life. Which makes it your most practiced habit.. because ‘how’ you breathe is just that, it’s a habit! And this means it is something you can alter, change and become better at. Breathing is also something that has numerous ‘rights and wrongs’ attached to it. 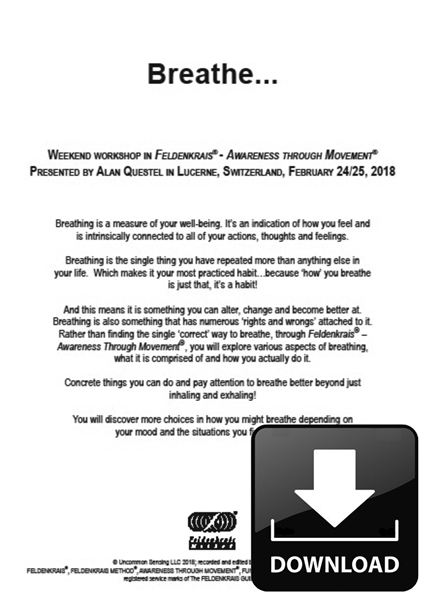 Rather than finding the single ‘correct’ way to breathe, through Feldenkrais® - Awareness Through Movement®, you will explore various aspects of breathing, what it is comprised of and how you actually do it. Concrete things you can do and pay attention to breathe better beyond just inhaling and exhaling! You will discover more choices in how you might breathe depending on your mood and the situations you find yourself in. 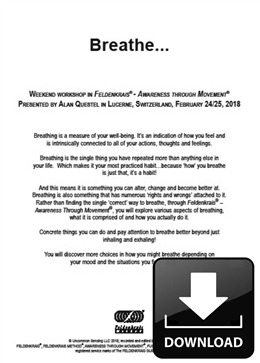 19-Day 2-Discussion & goodbyes - One sided lessons / The ‘right’ way of breathing, more tools and kindness!! !